In Piazza della Repubblica in Foligno, there's Palazzo Trinci a monumental complex consisting of a merger of houses and towers, now became the Museum of the cit. 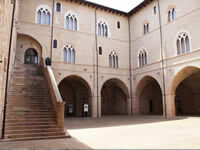 In the exhibition spaces are located the Art Museum, the Museum of Archaeological and Tournaments, Rides and Games. Second section: contains archaeological remains of the period from I to III centuryAD as urns and fragments of everyday objects. Admission: € 6.00; reduced € 3.00.